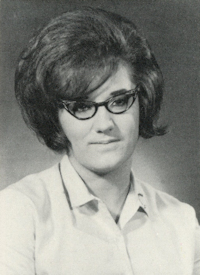 Obituary – Peck-Slay, Karen (Kelsey) « Perry High School Alumni Association, Inc.
Karen Peck-Slay of Duncan passed away in Lawton, December 27, 2008, after a prolonged illness. Graveside services will be held at 3:00 pm., Wednesday, December 31, 2008, in Memorial Hill Cemetery in Waynoka, Oklahoma under the direction of Callaway-Smith-Cobb Funeral Home. The family will receive friends from 6:00 pm to 8:00 pm, Tuesday evening at the Callaway-Smith-Cobb Funeral Home. Karen was born December 12 in Alva Oklahoma to Roland (Punk) and Margaret Kelsey. Most of her grade school life was spent in Waynoka (Rose Valley) where she lived with her parents and brother. Her family moved to Perry where she attended Perry High School. While on the farm she developed a life long love for animals and she knew her passion was to save animals and it would be a huge part of her life. Karen rescued thousands of animals while working for Lawton Animal Welfare, and as Director of the Stephens County Humane Society and H.E.L.P. (Humane Enforcement and Legal Protection). Serving beside her all those years was her best friend and sister by choice, Kolleen Moomey of Marlow. Karen was a champion for the abused and neglected. Karen is survived by her husband Randy of the home, two children and their spouses Angela Branum and her husband Pacer of Marlow, Mark Slavin and his wife LaQuita of Duncan as well as two “perfect” grandchildren Landon and Matthew Branum of Marlow. Karen also has 3 step-grandchildren she shares with her loving husband, Tyler Slay of Duncan and Lily and Ivy Slay of Texas. She is also survived by a brother Berry Kelsey and his wife Judy of Florida, nieces Juliette Chagnon of Maryland and Jennifer Brigandi of Florida, her nephew Chris Kelsey of New York, her aunt and uncle Jack and Jean Kelsey, cousins Jeff Kelsey and Diane Snodgrass. She also kept a close childhood friend, Peggy Haxton of Perry Oklahoma. At the end of her life Karen felt very blessed, she had just what she needed in life, her children, grandchildren, a husband who loved her and the satisfaction of her Lord walking beside her encouraging her how to live. It is her wish that in lieu of flowers a donation be made to St. Jude’s Children’s Research Hospital or the Stephens County Children’s Shelter.